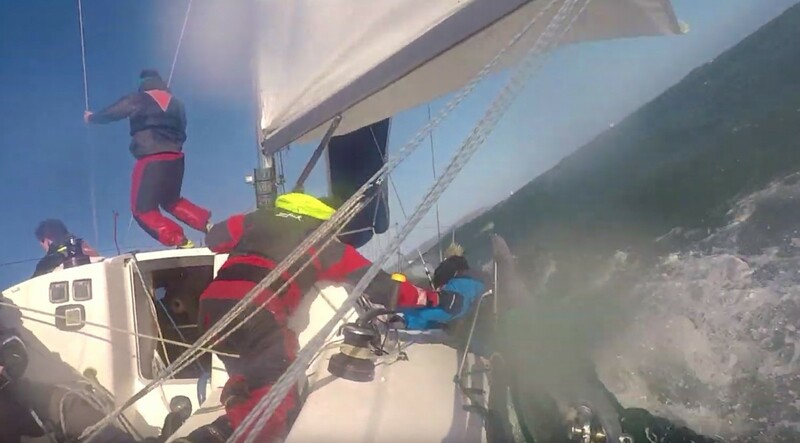 It’s not often a man overboard situation is caught on camera(s) but the crew of the J97 Windjammer can be seen in this video dealing with the potentially dangerous incident when a female crew slips over the side, through the guard wires during a tacking manoeuvre. It happened on a windy Sunday in late January, 2019 sailing out of Dun Laoghaire (Dublin). The incident happens at 1 minute 20 seconds into the video and it’s a good example of how a well-drilled and experienced crew retrieved the casualty, albeit taking three minutes to get the sails down and get back to her. In text book fashion one man keeps his eyes on, and points at, the casualty, another alerts the coastguard with a Mayday and there is no sense of panic. The skipper brings Windjammer to windward of the casualty, to offer her lower freeboard but it still takes two minutes to lift her inboard. Shortly after this the helicopter arrives to monitor the situation before leaving the competent sailors to it. Crew Conor Corson said: “The manoeuvre was nearly textbook, largely down to all of us having practised this plenty of times in the last number of years. But how many crews practise this regularly? And who would be confident in performing it on a cold windy January morning? The video was made by Windjammer‘s owner, Lindsy Casey. The boat is based at Dun Laoghaire in Dublin.